Very worrying, far more worrying than any warming. It is shown that, over the past ∼10000 years (the Holocene), deep Maunder type solar minima have been accompanied by sharp climate changes. It has been established experimentally that, at ca 4.0 ka BP, there occurred a global change in the structure of atmospheric circulation, which coincided in time with the discharge of glacial masses from Greenland to North Atlantic and a solar activity minimum. 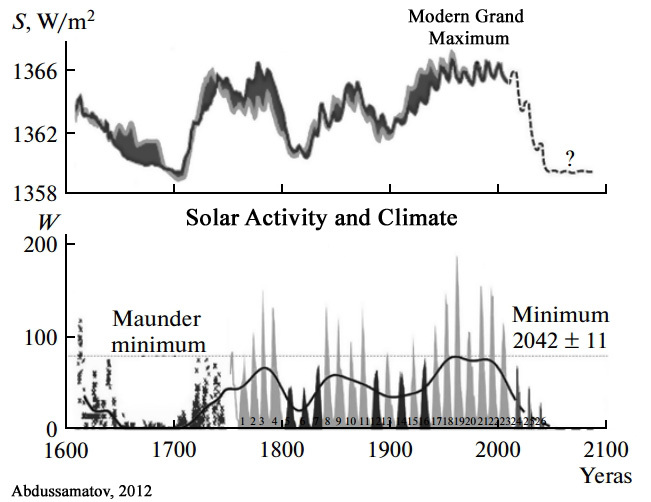 The climate changes that took place at ca 4.0 ka BP [4,000 years before present] and the deep solar activity minimum that occurred at ca 2.5 ka BP [2,500 years before present] affected the development of human society, leading to the degradation and destruction of a number of ancient civilizations. The Tavoliere salt-marsh appears to have contracted during the arid/warm phases associated to maxima of solar activity and to have expanded during the wet/cold phases of solar minima. This coastal area, characterized by a very flat topography and arid climate, appears to have been very sensitive to even minor hydrological and climate changes. Changes of solar activity, determining extensive environmental transformations, were also possibly responsible for the abandonment of the human coastal settlements of one of the most important Neolithic archaeological districts of Italy. Mediterranean Sea surface temperatures cooled rapidly during the Late Bronze Age, limiting freshwater ﬂux into the atmosphere and thus reducing precipitation over land. These climatic changes could have affected Palatial centers that were dependent upon high levels of agricultural productivity. Declines in agricultural production would have made higher-density populations in Palatial centers unsustainable. The Greek Dark Ages that followed occurred during prolonged arid conditions that lasted until the Roman Warm Period. The projected increase of atmospheric CO2 concentration ([CO2]) is expected to increase rice yield, but little is known of the effects of [CO2] at low temperature, which is the major constraint to growing rice in cool climates. The results suggest that yield gain due to elevated [CO2] can be reduced by low temperature. Cooler countries in the NH will start to feel this first. Another big worry is the parlous state of many electricity supply systems. The anti-CO2 agenda has left many of them balanced on a knife-edge. Wind and solar do not operate well at low temperatures, often consuming more electricity for anti-icing than they actually produce. 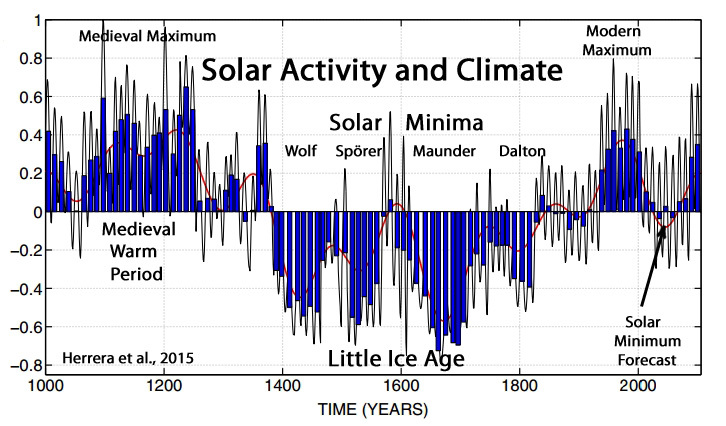 REALISTS have always been far more worried about cooling that a tiny solar forced amount of warming. zero proof that CO2 causes warming of a convective atmosphere. Let’s all just hope that there is a little bit more warming to come, because cooling and a resulting drop in CO2 would cause food and energy problems around the world. Scientists were seriously worried about the end of the interglacial in the 1970s…because they all know that cooling is MUCH worse than warming. Probably no scientist thinks we’ll be just fine once the Earth plummets into the next glacial. And the next glacial could indeed be imminent. 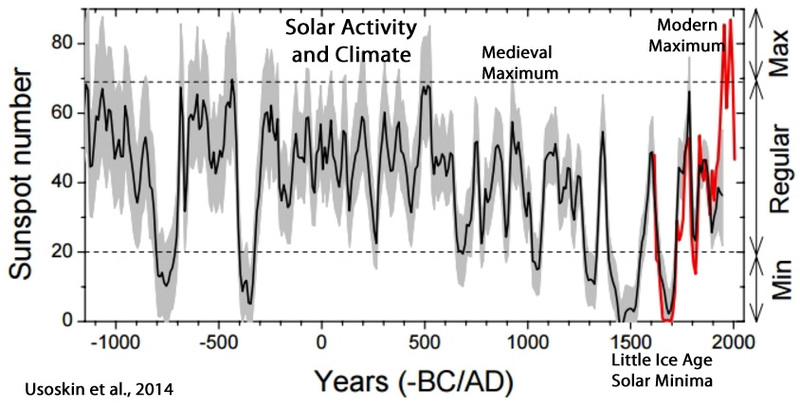 After all, interglacials typically last 10,000 years on average…and we’re in year 11,700 of the Holocene. Once we do enter into the next glacial, it’s 90,000 years of ice sheets. Excellent collation of relevant papers. A countering factor to all this is the rising water vapor. NASA/RSS has been measuring WV by satellite and reporting it since about 1979 as total precipitable water (TPA). I graphed their data and extrapolated it in Fig 3 of http://globalclimatedrivers2.blogspot.com It has increased about 8% since 1960 and is still increasing (through Feb 2017) at about 1.5%/decade. This increase is about three times expected from just temperature rise. 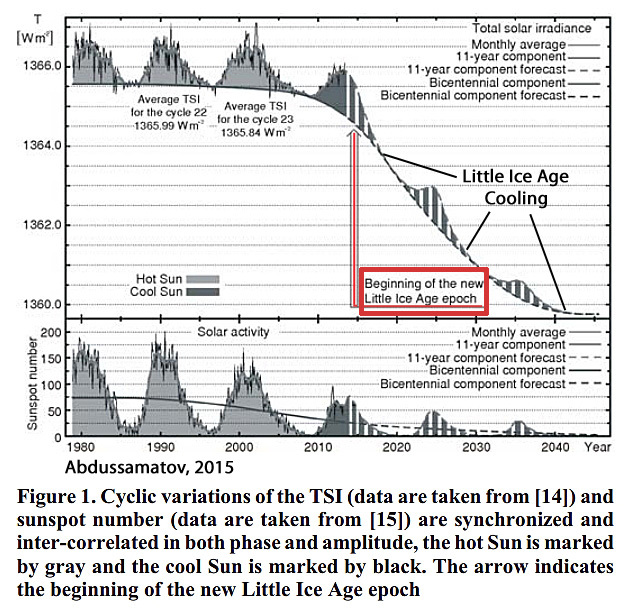 Once declining solar activity and declining ocean cycles prevail, expect a rapid global temperature down trend slowed only by the huge effective thermal capacitance of the oceans. Dan – More water vapour = more snowfall to feed glaciers. Thank-you Kenneth for this compilation of papers. Now come to the true meat of the subject of climate. 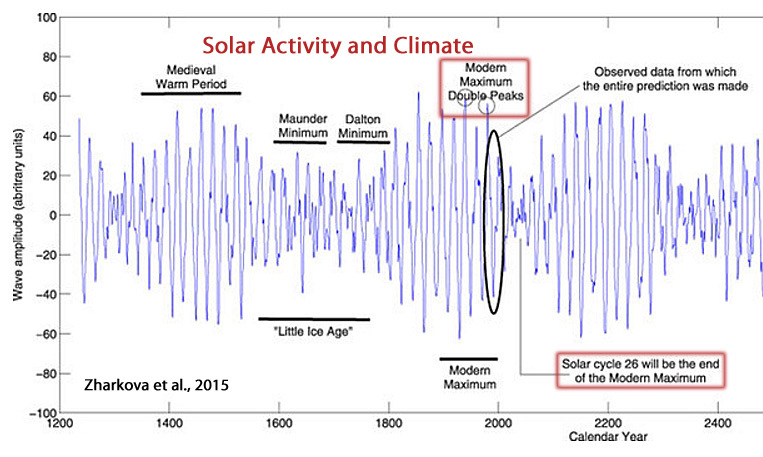 Solar events ARE the driver of climate change. Atmospheric CO2 level change is just a symptomatic adjustment nature makes after the effect solar changes penetrate through all the various natural processes. Man’s influence on CO2 level negligible given the natural response to the solar events are so large. AndyG55 – I agree, but who / what is really behind the anti-CO2 agenda, and do ‘they’ have a plan to deal with a potentially serious cooling period (other than to watch the developed world suffer the consequences of ‘their’ destruction of our energy security? Or are they just a bunch of Nihilists? 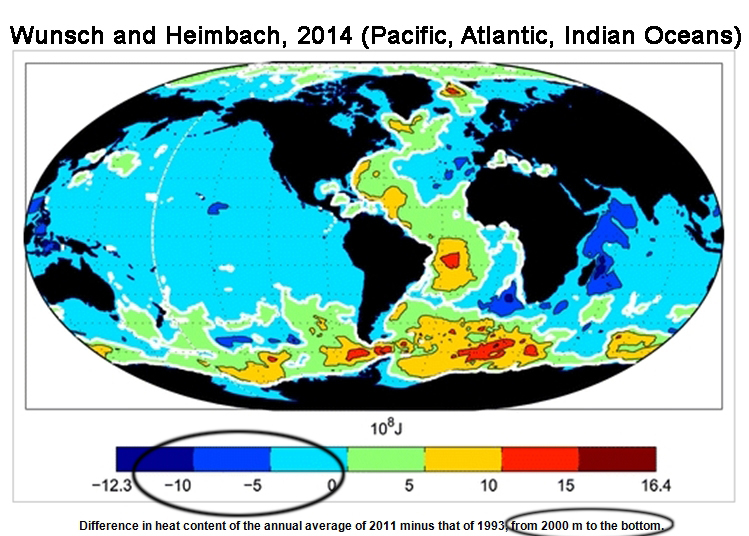 Have you looked at how warm the oceans are today? We have just backed off the el nino, yet here comes another, PERHAPS IN PART BECAUSE OF LOW SOLAR! 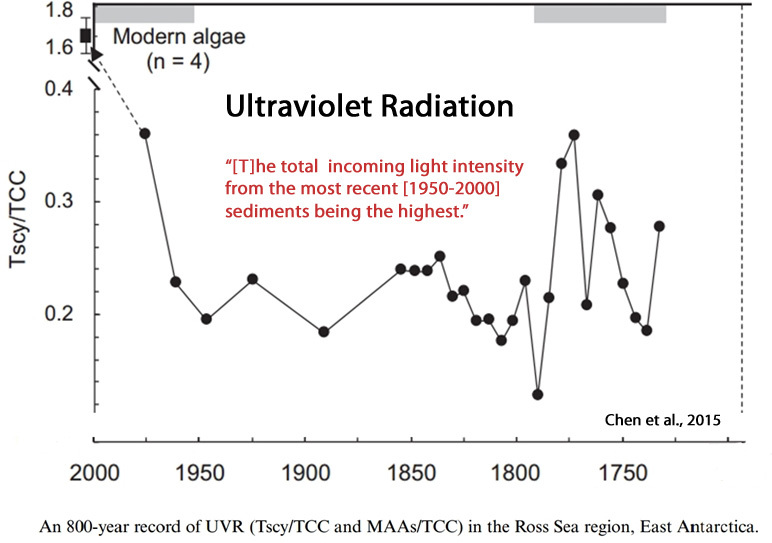 I am a big MOC believer, and that the state of the oceans today is not because of co2, but because of centuries of back and forth that is natural to the system. 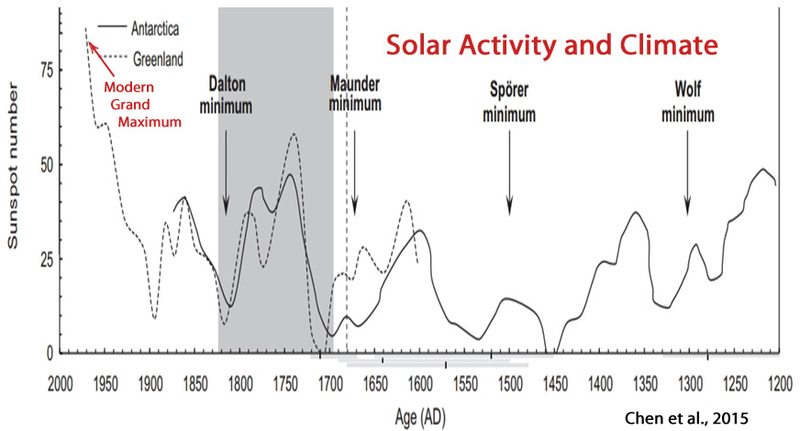 But what I question in all of this, is the ignoring of the fact that IF YOU ARE PLAYING THE SOLAR CARD, the run up to the LIA was 200 years of Maunder minimum which if you are so tuned into the sun, had to mean the oceans were COLD when the Dalton min came along. The oceans are very very very slow to change in the large sense. So we have the exact opposite going on now, very warm oceans and I think in large part to the last 200 years of the modern maximum. Throw in the chaos that evolves out of reaction to all this, and you get a system that is very warm but has the sun as the author. Now what happens when you decrease radiation over the tropical Pacific? the easterlies slow.. That in turn leads to build up of warmer water in the enso regions, which in turn leads to the release of water vapor into the atmosphere which is the number 1 GHG. While the increase over the temperature regions is relatively small compared to normal.. that increase is much greater relative to average in the arctic regions ( In other words, the effect on a few grams per kilogram of Water vapor over the tropics may not have that huge and effect on the temperature, but it does in the arctic when it works its way in there, and primarily during its winter) You are watching that in front of your very eyes. So what happens if we keep seeing el ninos until the imbalance caused by 200 years of high activity is finally washed out? 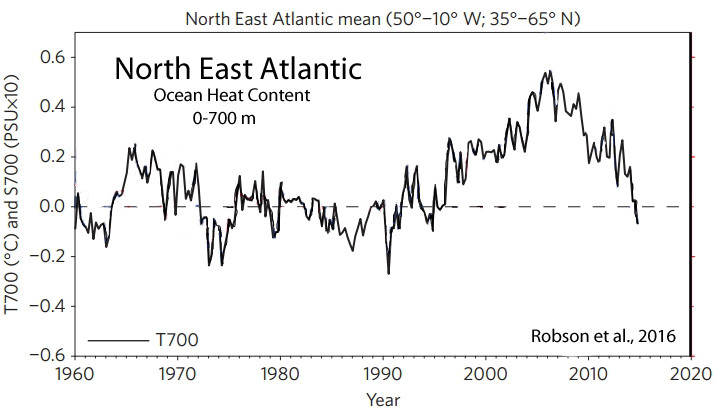 Can you explain how we have “very warm oceans” now when considering reconstructions that show oceans are only slightly warmer now than they were during the Little Ice Age, and much colder than during the Medieval Warm Period (and Holocene Thermal Maximum)? 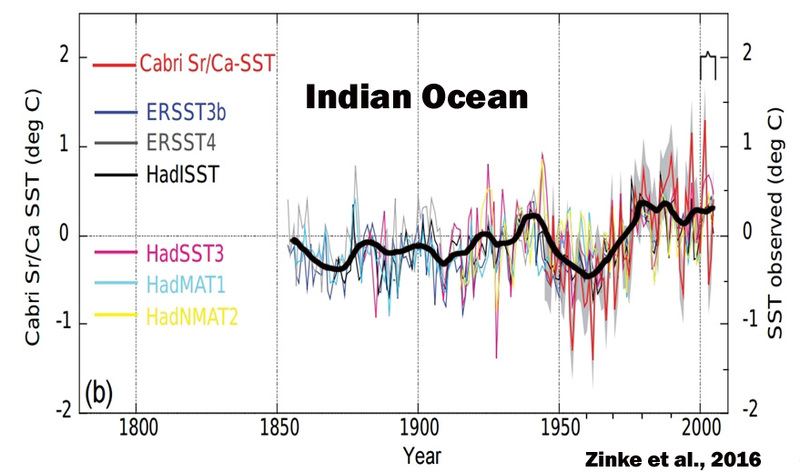 The entire case you present is predicated on the idea that we have “very warm oceans”. Relative to when? 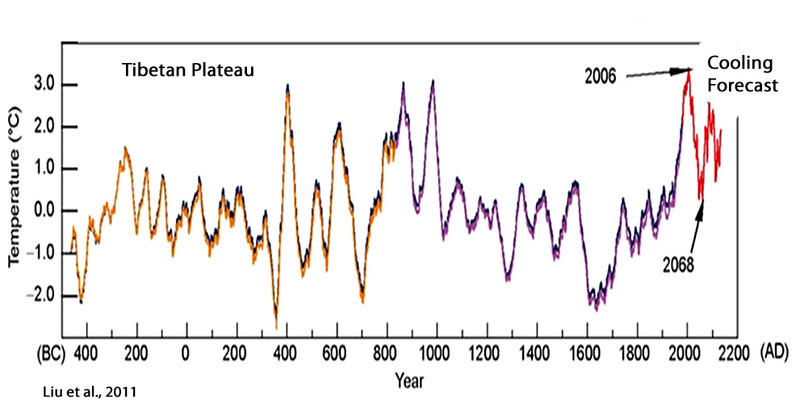 The coldest hundred-year periods of the Holocene? And how do we even know that the reconstructions are right? We don’t. So we have no idea if we have “very warm oceans” or not. 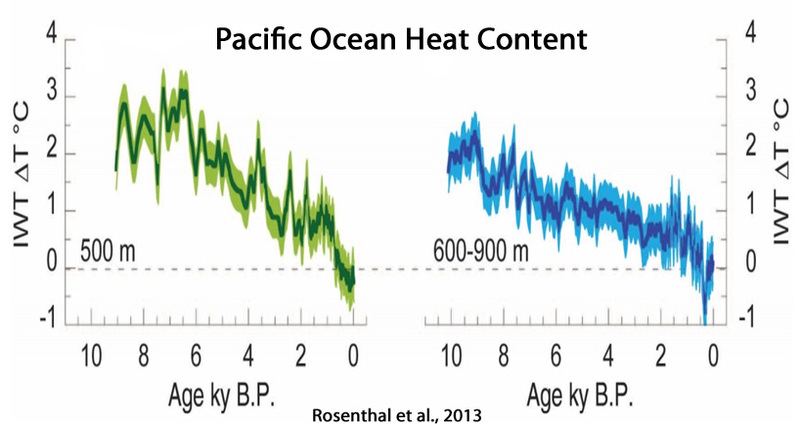 Considering all the other proxy evidence, though, it’s likely the oceans are currently NOT “very warm” relative to the last 10,000 years. On the other hand, below 2000 m…. I asked my students which would be worse. Total 6 degrees of CAGW warming, with humans having to mitigate their lives over some 100 plus years. Or having 1km of ice covering everything north of Iowa, for about 15,000 years. Their response was the ice ages are over, done, finito. Hence, was not a worry. Wow.. 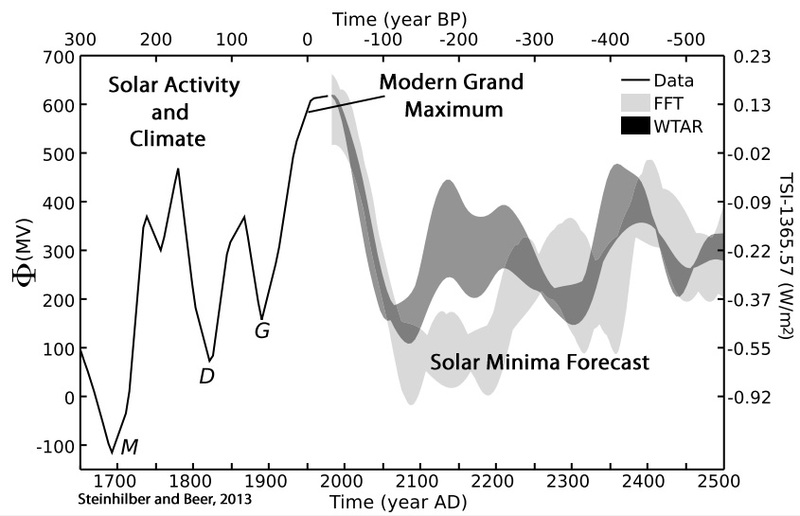 The last interglacial (Eemian, ~125,000 years ago) was several degrees C warmer than the Holocene (11,700 – present) has been. 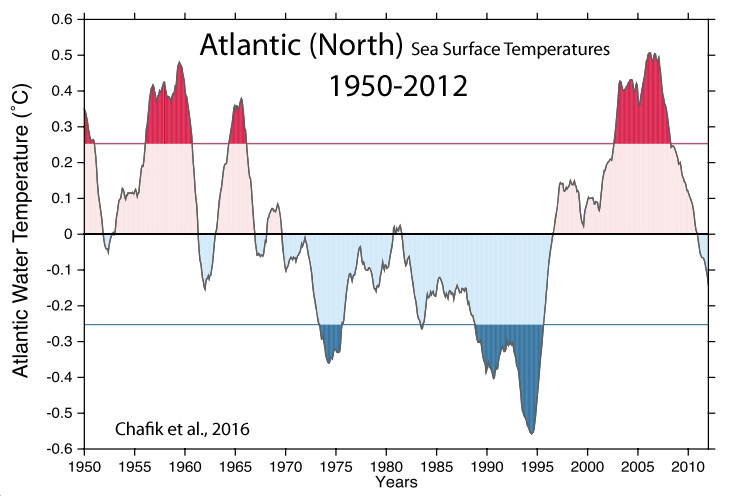 The Arctic regions were up to 8 to 10 degrees C warmer than now. And yet we still plunged into a ~90,000-year-long glacial period after that brief excursion of warmth. During the Pliocene (~5 million years ago), the Arctic was 18 degrees C warmer than now…and yet we still had glacial periods that followed. The students probably assume that the 1/100th of 1 percent change (0.01%) in the atmospheric CO2 concentration since 1900 is going to keep the ice sheets from enveloping much of North America…because that’s what they’ve been told. How sad that we have kids who are led to believe that we humans can control the weather, glaciers, storms, water temperatures…with our emissions. Your efforts are invaluable to those of us fighting the disinformation! Thanks so much! Please keep up the good work! The Alarmist’s become the science deniers when they refuse to accept current peer reviewed papers. I wish all the global warming alarmists who instigated the freon evolution (they did nothing to change the chemical composition of refrigerants that supposedly killed the ozone, they only blended them, creating an azeotropic mixture that easily reverts back to its original components which are the r11 r12 r502 r22 refrigerants they have banned) this of course made millions for Dupont (whose patent for these refrigerants expired in the same time frame as when the ban went into effect) and made everyone retrofit or replace everything with an inferior product that has higher pressures, harder to work with, requires oil that is so volatile it will absorb moisture from the air, and still needs to be recovered and bottled because after all, it’s basically the same refrigerant. Companies who developed an actual environmentally safe refrigerant were quickly snuffed, bought out, or received so much bad press they went bankrupt.